EPION’s Standards Implementation Committee is happy to announce the Fidelity Pilot Report is now available. 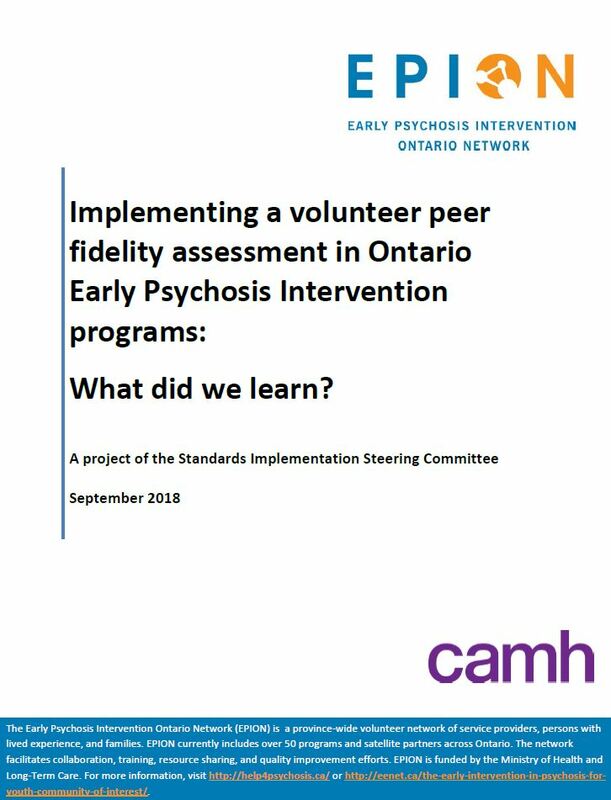 “Implementing a volunteer peer fidelity assessment in Ontario Early Psychosis Intervention programs: what did we learn?” describes the Fidelity Pilot project conducted by the Standards Implementation Steering Committee (SISC). The Fidelity Pilot project was initiated to test the feasibility and value of using an innovative peer assessment method to assess the fidelity of selected Ontario EPI programs. Peer assessor teams of volunteer EPI program staff and CAMH evaluators were formed to conduct the program reviews. The pilot was completed in nine programs. Develop and implement a peer fidelity assessment process with a subset of Ontario EPI programs. Evaluate the assessment process, considering consistency, feasibility, and value to programs. Review fidelity results, considering how they could be used to support program and sector improvement. Make recommendations for future fidelity monitoring. This report describes the review process and the results of the evaluation. Also included are recommended next steps related to fidelity monitoring in EPI programs.